Minnesota Historical Society Press, 9780873519649, 32pp. From winter hunts to picnic foraging, Coyote makes his deliberate way through the seasons in his urban habitat. His adventures come to life in this lavishly illustrated tale. Down at the lake, Coyote is hunting, eager to fill his empty belly. When winter ice crackles, springtime frogs warble, summer thunderclouds threaten, and autumn leaves tumble, Coyote searches for his next meal. He stalks voles, rabbits, snakes, and geese, but there’s no guarantee he’ll catch his dinner. If his stomach growls, he’ll steal vegetables from a tidy garden or nibble snacks from a trash can, maybe even leftovers from a family’s picnic. Coyotes live on the plains and in deserts, on farms and in woodlands; they even live in towns and cities. 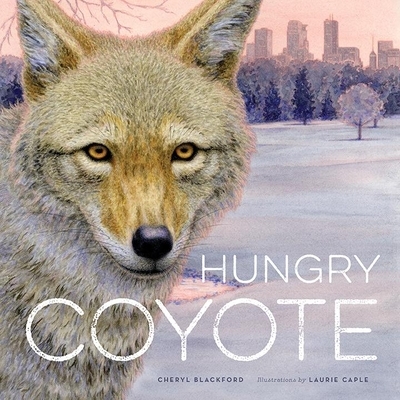 In Hungry Coyote, lush, lifelike illustrations by natural history artist Laurie Caple accompany Cheryl Blackford’s poetic imagining of a year in the life of an urban coyote. Across the pages, Coyote sneaks, skulks, and scurries in his constant quest to feed himself and his growing family. While Coyote hunts nearby, people enjoy a city park. At the lake, in the marsh, among the trees, children jump, twirl, and play, oblivious to his secret life. But if they listen closely they might overhear Coyote’s wild nighttime conversations with his mate and pups. Is he planning his next hunt? Cheryl Blackford is the author of three third-grade nonfiction books and the middle-grade novel Lizzie and the Stolen Baby. Laurie Caple has created artwork for more than twenty books as well as the periodicals American Girl and Cricket.